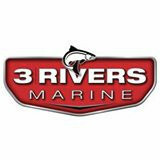 3 Rivers Marine is a full circle marine parts and service provider. 3 Rivers marine services most major motor brands, and is a warranty service provider for Yamaha, Honda, and Mercury outboards. We carry a huge inventory of parts, making for quick turnarounds for our service customers while providing a convenient resource for our Do-It-Yourself friends. Whether you’re looking to repair, repower, or perform preventative maintenance, 3 Rivers Marine is your partner in keeping your boat performing the way you’d like.